It's hard to believe a whole year ago tonight I went into labor with you. When I think of that night - your daddy at work, Gramz fumbling with the gate to get upstairs to see me, Pops driving me to the hospital, Dr. Harrison miraculously being on shift, the nurse breaking her wrist, contractions, pushing for just a few short minutes... then you, your warm, beautiful little body on my chest. Some of the happiest moments of my life. Tonight, as I rocked you to sleep for the last time before you're one, my mind flooded with memories of the last year. 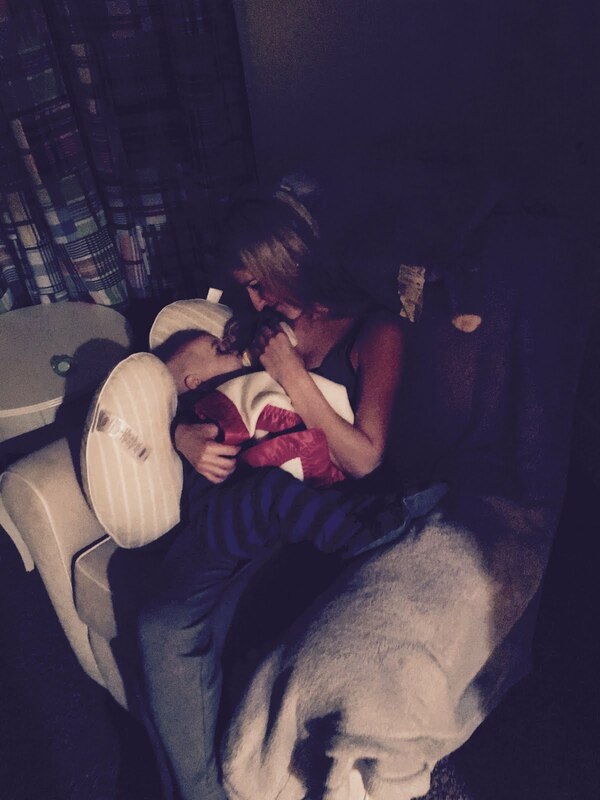 The hundreds of times I have rocked you, sang 'You are my Sunshine', slept in that chair so you could be upright to help your breathing, the hours I spent in the car with a broken heart listening to you cry, the thousands of diaper changes, the snuggles, the kisses... and my most favorite, that smile. Oh, Nolan... your smile. You have the most radiant smile I have ever seen. It's genuine, and I can't help but smile, too, when you flash those big blue eyes. This year has been filled with a profound amount of love because of you. I completely underestimated how overwhelming it would be to love a son like I love you. This last month has been a big one. We celebrated your 1st Christmas, you met Santa a few times (you weren't too impressed), you opened presents, tried new foods, we took a spontaneous trip to Disneyland, you started taking steps (7 in a row is your record), and spent lots of time with family. This month you have really fallen into a routine of sleeping, and besides the occasional time we have to sneak a paci back in your mouth, you sleep through the night for 12 hours. As much as I didn't want to, we also stopped breastfeeding this month. You took formula for the first time about 3 weeks ago, and within the last 2 weeks have been exclusively on formula. Tonight you made the switch to milk, and you did very well with it. You are still eating very well for us. You love pasta, yogurt, waffles, fruit - all fruit, but especially bananas. For Christmas, Santa came a little early to our house because daddy had to work, then we celebrated with daddy's side of the family at our house. You got lots of new presents and Santa brought you a Thomas the Train Roller Coaster, which you loved! On Christmas Eve, we went to Gramz and Pop's house and had a big breakfast together and opened presents. Then we went to Christmas Eve night with the Z family. Christmas day was very mellow. We stayed with Gramz, Pops, and your cousins and played with new toys. This season was so special with you. You really loved the Christmas tree and lights. And you were a natural at opening presents. Daddy and I don't think you've grown a ton in the last month. You're still wearing 12 and 18 month sized clothes. You are in a size 4 diaper. We measured you the other day and you were about 29 inches tall, and I estimate that you are about 22 pounds, but we will know for sure at your doctor's appointment on the 30th. You love your toys - especially figurines, balls, and anything with wheels. You love your paci and have really gotten attached to your special blankets from Gramz. She had to get a couple more for you because you're starting to love them so much. You've really been babbling more this month and you are saying "ma ma" and "da da" more often. You're taking steps and standing all by yourself, but you still prefer to crawl. You love to play peek-a-boo and will sometimes start playing it randomly, which makes us laugh. You also clap your hands when we sing. You give high-fives, wave hello, and you are doing so much better in the car! You also are very good at sharing, especially food, which is so cute! Nolan, I have never seen a baby love someone as much as you love your Pops. You and him really have a special connection, and the thought of it almost brings me to tears. He is hands down your favorite person on the planet. When pops is around, you refuse to go to anyone else. If daddy or Gramz try to take you from him, you tuck your head into his neck and grab on tight to his shirt (sometimes you even snub me!). If he has to set you down or leave the room, you whine until he comes back. You love to snuggle him, lay on his chest, and at Christmas Eve, Gramz and I looked over and you were just randomly giving him kisses. The relationship you two have is truly sweet. He absolutely adores you and I think you may have a little of him in you, and I am so grateful. (We think you may even be left handed like him). I am not sure if you will ever read through these letters that I have written to you over the last 12 months. They may be a little repetitive, but I don't want to forget a single thing. If you are reading this, years from now, I hope you can feel my love. Nolan, I am so unbelievably proud to be your mom. I'm proud of you, proud of your smile, your sweet soul, and your sense of humor. You truly bring so much joy to my life. My wish for you is that you're kind, happy, surrounded by a supportive tribe of family and friends, and you follow your heart. Believe in yourself... even just looking at your compact little body, I already know you're capable of so much. Don't sweat the small stuff, stay positive and optimistic, be confident and know that your dad and I are always here for you... no matter what!! The world is yours... work hard, set goals, and enjoy it! I love you to the moon and back, times infinity. Happy 1st Birthday. Your first year of life has been one of the best of mine. I rocked you to bed tonight for an extra long time, kissed your forehead, and listened to you breathe. I wish so badly that I could freeze time, but I can't, so I am going to hold on tight and enjoy the beautiful ride of witnessing you grow, change, and blossom. Rocking you to bed tonight.